The development of software automation in accounting has been driven by a core need that exists in the industry, and a pain point that many firms suffer from – the overwhelming amount of time, admin and client-chasing needed to set up and service a new business client. Onboarding is a fundamental part of every practice’s operations, whether you’re a new sole-partner practice or an established firm, but getting it right takes a significant amount of time and effort – creating a key area of inefficiency. What we saw was how long-winded and inefficient this was as a process – with emails pinging back and forth, and multiple opportunities for hold-ups and human error to creep in. And you’re not just looking at onboarding when it comes to getting an engagement up and running. There are engagement letters to sign, permissions to talk to the client’s incumbent accountant and the collection of UTR numbers and Companies House information. When you add up the admin time spent by your team on these tasks, it’s easy to see how automation has the potential to significantly lighten the load. When you automate the key elements of running the practice, that overcomes the inefficiencies of the old approach and saves a huge amount of time for you and your practice team. When I was an accountant I could see that the traditional approach to onboarding wasn’t working, so the obvious thing to do was to have an automated system for this process – and this doesn’t just apply to registration documents, it could be engagement letters or other documents that need to be signed and sent back. You can also use the built in AML ID verification process, saving clients from traveling to your office. Everything is completed online and all this data is automatically updated in the firms portal too. And in doing all of that, the time saved is tremendous – there’s no paperwork, there are less steps and everything’s done securely in that online space. Another potential stumbling block when taking on new clients is getting the information you need from their previous accountant. Without those clearance letters taken care, you can’t get the prior accounts information needed, so it’s vital to make this a speedy handover. Having gathered the data you need from your new client and selecting the required services, there are a number of automation tools in place which create deadlines off the back of the period ends for the different services. Once you’ve entered the period-end dates (or if they’ve been pulled in automatically by the integrated Companies House feature [soon to include HMRC data]), the system pulls through the relevant information, checks the period-end information and sets the deadlines for those tasks. And by setting up the period-end and the deadline, the system then automatically creates a task list and the required workflows for these specific clients. In essence, you’re automating the whole process from beginning to end. That saves time for your client and your team, and provides all the key information you need to get the engagement kicked off and running as quickly as possible. With the software chugging away doing the basic set-up tasks for you, that frees up a significant amount of fee-earning time for the practice. To measure up the time-saving, think about how much time you’re currently spending emailing your clients to chase up missing information. It can take between 5-10 minutes to craft an effective chaser email, so you’ve only got to send 4-6 emails to one client before you’ve clocked up an hour of time. Multiply that by the number of clients on your books and you can see the negative impact this has on your productivity. 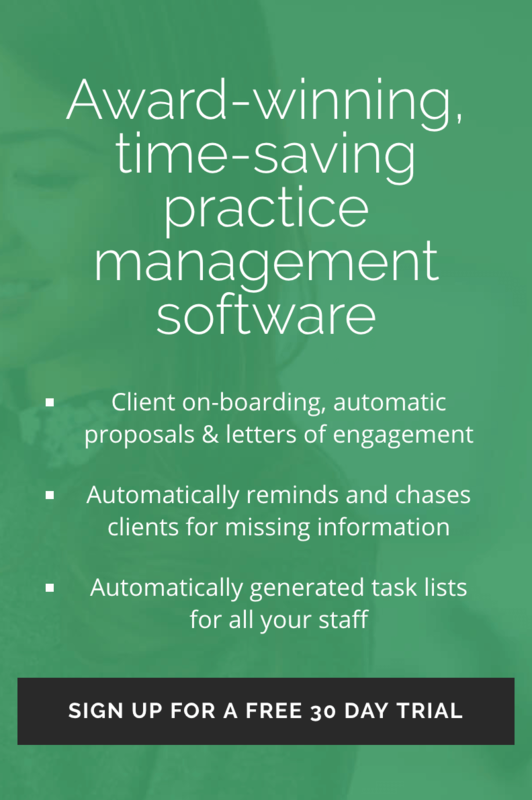 By including mass-automation features in AccountancyManager for chasing clients, sending reminders, and pinging out notifications to your team, the software claws back that time for you – saving 2 or 3 hours per client, per year, in real terms, not to mention the time saved managing your staff and their task lists. The automation elements serve to free up time, especially for the fee-earners in the practice, and that was a core aim for me when I was in practice – to take the admin load away and to be able to look at other ways of making the firm productive and profitable. Freeing up time to generate more fees, or to provide a better value-add service to your existing client portfolio. Removing the need to employ as many admin staff, while still being able to grow and take on more clients. Improving your work/life balance, by allowing you to get the job done in less time and giving you the chance to focus on life outside of the practice. So it’s either a fee earner, a staff-saver or a stress-saver, depending on how you choose to implement that time-saving within the practice. When you’re growing your practice, the purpose of automation is to increase efficiency and to maximise profit. The bottom line is that it’s about saving time so you can focus on other areas. But it’s important to understand that it’s not just about pure financial profit. Yes, you can use the time you free up to create more business, but you can also use that time in other productive ways. Time is such a valuable commodity, and you can choose to spend that time making more money, or spend it with family, loved ones or pursuing other passions outside of the business. The important thing is that driving efficiency through automation gives you choice, and that is something that many practising accountants find they don’t have. AccountancyManager has been created as a tool to free up your time, create greater profit and also give you more choice as a practising accountant – the choice to transform the practice to either make more money, or to have more free time… and create a more streamlined and efficient practice as a net result.